The million-dollar question every advisor struggles with: how should I charge for my services? This inevitably leads us to ponder several more questions such as, "Should different types of clients pay different rates?" and "How do I raise my fees without losing clients?" In this webinar, two experienced XY Planning Network advisors talk through some of these tricky questions. 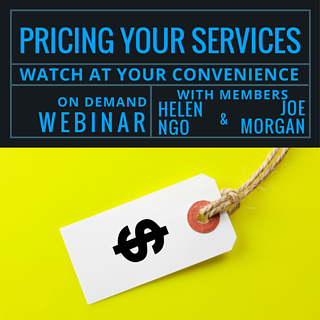 Joe Morgan and Helen Ngo provide some food for thought to consider as you think through your own pricing structure. What are the variety of fees and fee models you use? What do clients expect to pay? Has anyone ever disagreed with your pricing? What did you do? Panelist: Helen Ngo, a CERTIFIED FINANCIAL PLANNER™ professional, began her career at Raymond James in 2008 at a private practice in Atlanta, working with a team of advisors manage over $500MM in assets. In an effort to expand her knowledge and skills, she moved to Tampa, FL and entered Raymond James’ Financial Planning Residency Program, a rigorous 2-year curriculum designed to sharpen a financial advisor’s expertise in investment management, asset preservation, and financial planning strategies. Gaining much experience working with advisors in Florida and Atlanta, Helen formed an independent practice, Capital Benchmark Partners, LLC, to dedicate more time with her clients and focus on helping professionals in the fields of law, consulting, dentistry and medicine to build their wealth. Furthermore, she specializes in business planning for women entrepreneurs. Panelist: Joe Morgan, CFP® is passionate about creating customized financial advice to individuals and families who seek clarity in their financial lives. His clients have a wide range of wealth, income, and investable assets and he feels privileged to act as advisor, educator, guide and protector of their wealth. "Family financial challenges have always been an afterthought for Wall Street as evidenced by the lack of appropriate services and an unwillingness to engage on a personal level," Joe says, "I want to end the destructive risks taken on as a result of false and misleading statements that come out of the financial world by providing a balance between your financial aspirations, resources, and accepted risks." To get this done, he started JWM Wealth Management after earning the Certified Financial Planner (CFP®) designation. Schedule an introductory 30-minute Call with Stacey and her Team to get started on XYPN Membership!